According to the press release, Fresnadillo will collaborate with a writer on the screenplay, that name expected to be announced shortly. What’s more, the reboot is confirmed to focus on the character of Eric Draven (infamously played in the 1994 film by Brandon Lee, who was killed on-set). "The original Crow was groundbreaking cinema," adds producer Edward R. Pressman, "Its gothic visual and musical ideas influenced a generation and cinema itself. With Juan Carlos, we have every confidence that his new Crow will have a similar impact on the contemporary audience." Along with Pressman, the film will be produced by Jeff Most, Relativity’s CEO Ryan Kavanaugh, and Apaches’ Enrique López Lavigne and Belén Atienza. José Ibáñez, Pressman Film Corporation’s Jon Katz, and Apaches’ Jesús de la Vega will serve as co-producers. 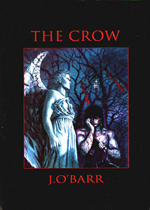 Originally a 1989 comic book miniseries by O’Barr, "The Crow" spawned a number of graphic sequels, four feature films and a television series. The reboot, planned since last year, was, at one point, going to be directed by Stephen Norrington. He departed the project last October.